Rehema Tukai grew up in Kondoa and works in Dodoma, Tanzania’s capital city. Until now, visiting her family in Kondoa involved a five-hour journey along a bumpy and dusty road. Thanks to a new road co-funded by the African Development Bank, it takes her a little over one hour to travel the same distance. Tukai was one of several locals to celebrate when the President of Tanzania, John Pombe Magufuli, and the President of the African Development Bank, Akinwumi Adesina, commissioned the Dodoma-Babati road project on Friday. With the completion of the road, traders and travelers now conduct immigration procedures on only one side of the border, reducing time and costs. Thanks to these efforts, the volume of trade between Tanzania and the rest of Eastern and Southern Africa has risen to US $1.1 billion in 2016, a level both Adesina and Magufuli described as historic. Magufuli said the Dodoma-Babati road will improve the lives of people living in Tanzania and neighbouring countries. “Projects financed by the African Development Bank have a real impact on people,” Magufuli said, thanking the Bank and the Japan International Cooperation Agency (JICA) for their strategic partnership in co-financing the project. “Roads change everything. They bring hope alive. Such is the case of this road. While economic activity expands, so will family connections. It has brought much joy to families,” said Adesina, referring to beneficiaries such as Tukai. The 251-kilometre road is expected to provide rural communities with renewed hope, through expanded economic activities, improved access and better prices for farmers, and to transform several communities. The Bank President congratulated Tanzania on the 54th anniversary of the union of the Republic of Tanganyika and the People’s Republic of Zanzibar and described the country’s unity as its strength and an example for the rest of Africa. “Tanzania is headed in the right direction. With 7% economic growth this year, it has posted one of the highest growth rates in the world. That shows me the future of the Republic is very bright indeed! There will be need for massive physical and social infrastructure. There will be need for a Dodoma Airport. There will be need for a new road network to support increased transport, especially the Dodoma Ring Road. I wish to assure you that the African Development Bank will strongly support you on critical infrastructure for the new City of Dodoma,” Adesina said. The African Development Bank has invested US $3.6 billion in Tanzania, with an active portfolio of US $2 billion, 53% of which is in road projects. The institution has invested more than US $1.1 billion in five road projects in Tanzania, covering close to 1,400 kilometres. 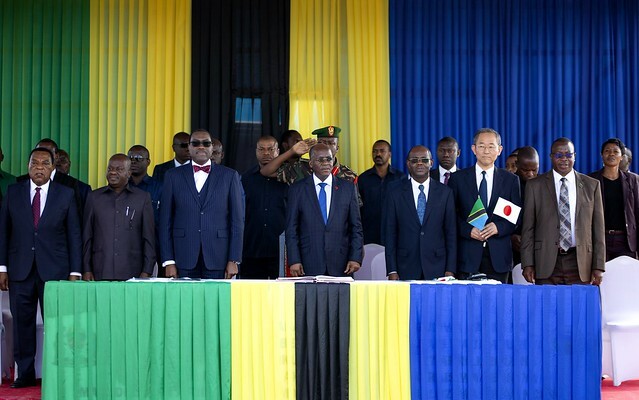 At the commissioning ceremony, the Japanese Ambassador to Tanzania, Masaharu Yoshida, commended the African Development Bank for its contribution toward the completion of the project.